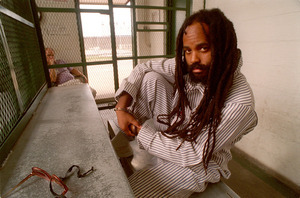 Mumia, Prison Radio, and the constitutional rights of all of us to Freedom of Speech are in serious jeopardy. This is a clear attempt to silence Mumia, by passing bills supposedly intended to help victims. The FOP simply wants to shut prisoners up and shut Prison Radio down! Prison Radio has vowed to continue to broadcast his words, regardless of threats or intimidation. Prison Radio has pledged that if the DA or AG sues Mumia and gets an injunction we will have dozens of notable people stand in for him and read his work so that his words will continue to reach the airwaves. Also consider that Mumia has recorded over 3,000 essays and published seven books (2 more will be released in 2015) in nine languages, and has three major broadcast and theatrical movies of which he is the subject. The latest movie “Mumia: Long Distance Revolutionary” is currently airing on the STARZ network, sold out theaters from coast to coast, and has been translated into German and Spanish, and has sold 20,000 DVDs. 1) Call PA Governor Tom Corbett and demand that he veto SB508. Watch the video of the FOP and PA state senate authorizing legislation for injunction to silence Mumia. 10/6/14 full press conference with Gov. Corbett, DA Phil Seth Williams, etc. Dear friends, please realize that we are carrying a heavy burden. We are putting up 2-3 Mumia’s essays each week and we are now engaged in a legal battle of great import. The first amendment stands in the balance. We have a matching grant of $45K – yes, that is right! 45K. We need to match this grant by Nov. 15th. Can you help us?